“When one is confident in one’s own skill-set there is no competition,” says UAE based founder of Avastave, a luxe womenswear brand for the modern woman who adventures between a glamorous traditional Middle Eastern aesthetic and a sleeker, contemporary look. Meet Dmitri Ruwan, a womenswear designer, blogger and YouTuber. 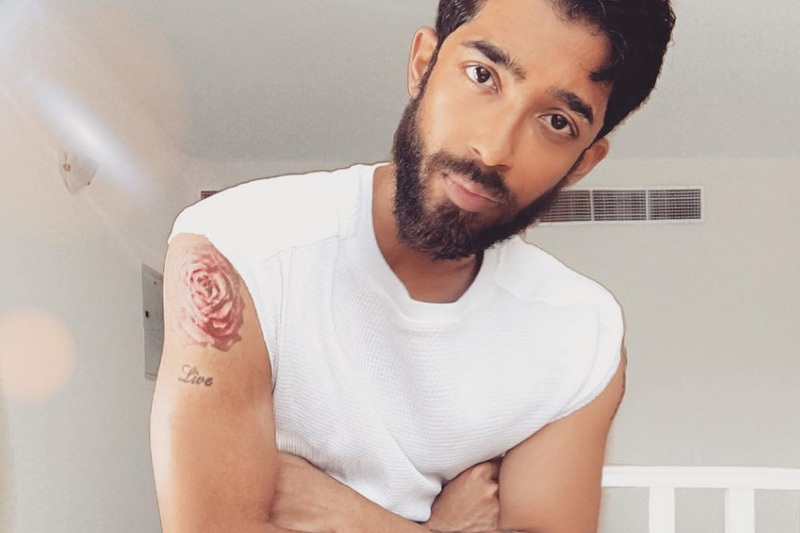 A man with endless talents and a penchant for championing other local designers and local artisans, Ruwan not only inspires with his own collection, but also his words as he discusses the highs and lows of business, supporting other emerging designers, his goals for Avastave and his hopes for Saudi fashion. Tell us a little about Avastave, the brand, and where it all began. Avastave is more than a brand, it’s a mindset. It is an exploration of the concept of love, through clothing. Born from the tale of forbidden love between Sir Tomas Maitland and Lady Lavinia (a British Governor and Sinhalese dancer) and further propelled by humanity’s need for love in all forms. Our purpose is amplifying the love people feel for themselves and others through a careful combination of expert design, unique fabrics and specific color tones that are renowned for inducing spiritual awakening. Avastave is a Sinhalese word for circumstance, the poetry of this lies in how the direst of circumstances can often lead to the most beautiful beginnings. Your collections have a strong Middle Eastern influence with your use of luxe fabrics and kaftans, tell us a bit about what you find so inspiring about the Arab culture and style? As an expat living in Dubai since the age of six, Dubai has been a home away from home for me. It is only natural then that Avastave would be the perfect symbiosis between my Sri-Lankan heritage and Middle Eastern upbringing. Our range of one-of-a-kind kaftans that were launched as part of the resort collection were inspired by the imagined journey of Lady Lavinia to the Middle East. Each kaftan, from fabric to design, color and name excels in promoting wellness for the wearer and pays tribute to the mesmeric colors of the desert landscape. Your collection is extremely sleek, glamorous and hyper-feminine all at once. Who is the Avastave woman? She is a seeker, a woman on a quest for spiritual growth. Acutely aware of her power to influence positive change through her consumer habits. Our silk dresses are made utilizing fabrics sourced from small traders based in the Middle East and employing the services of local artisans while our newly launching line of organic tops are ecofriendly and embedded with positive energy. Avastave is built to celebrate the dream that is fashion but also to effectively promote wellness and love. Are you faced with any obstacles as an emerging designer and how do you overcome them? I think the most challenging part of being a designer is battling this constant misconception that all creatives hold unlimited capital or are in some way inept at doing ‘real jobs’. There are very real obstacles to overcome in this business that require both skill and intellect, ranging from negotiating cost of production to meeting exhibitor costs, managing PR and handling client lists. It’s a lot of work but, the best things in life never come easy right? I believe the key to avoid most business pitfalls is to never compare your successes with that of others. Is there any advice you could share with young aspiring designers who really want to make it within the industry? Be different. Dream different. Encompass difference. Difference is what set Coco Chanel apart from the rest and launched Yves Saint Laurent’s career and cemented Tom Fords iconic status. Whatever you do in this life, remember that success comes from your uniqueness and the ability to see things in a way that others can’t, that and a lot (a lot) of hard work! If you could show your own collections at any fashion week in the world, where would it be and why? Personally, I think a showroom space in Los Angeles where people can experience the latest collections from Avastave is more fulfilling. As designers we’re all taught to aim for the lofty illusion of Parisian catwalks, but never to rethink the roadmap of how it all works. My stance for the success of Avastave is steady, healthy growth and bringing positivity into the lives of the people who wear my clothes. Fame and success are the products of authentic dreams. Saudi Arabia has been making some incredible reforms for women as well as its arts and culture and had its first ever fashion week this year. Could Saudi Fashion Week ever be a platform for your collections? Saudi Arabian women have the most extravagant tastes, and their shopping habits are wide and varied. For me, it is an honour to have modern Saudi women support Avastave, which is really all about love and self-expression In terms of commercial viability, online platforms do better than runway shows in Saudi Arabia, so for now we’re focused solely on our ecommerce platform. However, the future is an endless trove of possibilities. What do you hope to see for the future of fashion for the women of Saudi Arabia? Freedom of expression is constantly evolving in the Middle East and specifically in Saudi Arabia. While clothes can’t change the world, people most certainly can. As designers we can guide a positive dialogue towards positive change through meaningful products. So, my hope for the future of Saudi Fashion is the continual growth of self-expression. What empowers you and how do you use your position, as a designer establishing himself, to empower others? Supporting other creatives results in the most sensational feeling of accomplishment, whether as a consumer or a fellow entrepreneur. Brands like Rakate, Style Your Amoire and White Almonds are amongst a few of the local brands I continually support through my purchasing habits and social media, because there is room at the table for everyone. When one is confident in one’s own skill-set there is no competition. Also, I think giving back to the community is important and I regularly contribute to charity organizations like the International Orangutan Foundation.